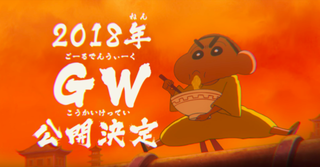 The new movie of Crayon Chin-Chan is announced! It has been announced the newest Shin-Chan Movie which has the name of “Crayon Shin-chan the Movie: Bakumori! Kung-Fu Boys Ramen Rebellion” which will premier on the Golden Week. On this movie the focus on Martial Arts will take the center of the stage. Wataru Takahashi will direct the movie; Kimiko Ueno is in charge of the scripts.